Set a rimmed baking sheet on the top oven rack; preheat to 475 degrees F.
Put up water in a large saucepan. Put the potatoes into the water. Cook for about 10 - 15 minutes until potatoes are soft enough to mash.....not mushy. Meanwhile, generously spray an 8-inch-round cake pan; sprinkle in 2 tablespoons Panko crumbs and shake to coat, then tap out the excess. Add 2 tablespoons butter and the parmesan to the potatoes. Remove and place in a bowl and mash. Gradually mash in the beaten eggs. Spread half of the mixture in the prepared pan; top with the cheese, peppers and parsley. Top with the remaining potato mixture and smooth evenly. Sprinkle 1 tablespoon breadcrumbs. Spray top of potato cake. Set the pan on the hot baking sheet and bake until puffed and golden, about 15 minutes. Run a knife around the edge to loosen, then unmold. Mashed potatoes are hard to pass up...rich and creamy. I've never seen a dish like this before. Looks very filling and comforting. Thank you for sharing! Your Sicilian Potato cake sounds lovely, Chaya. What wonderful comfort food. Thank you for being a part of the Hearth and Soul hop. 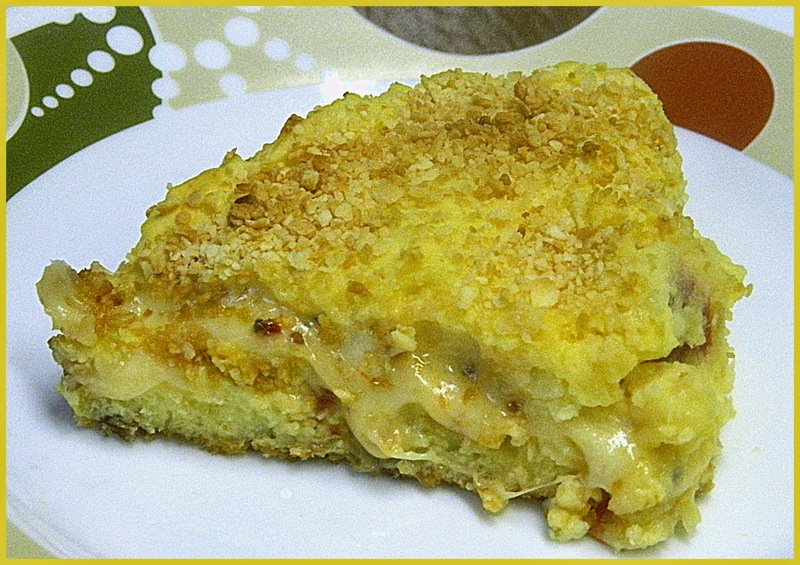 Deliicous potato and egg cake, thanks for sharing with Hearth and soul blog hop, pinning.